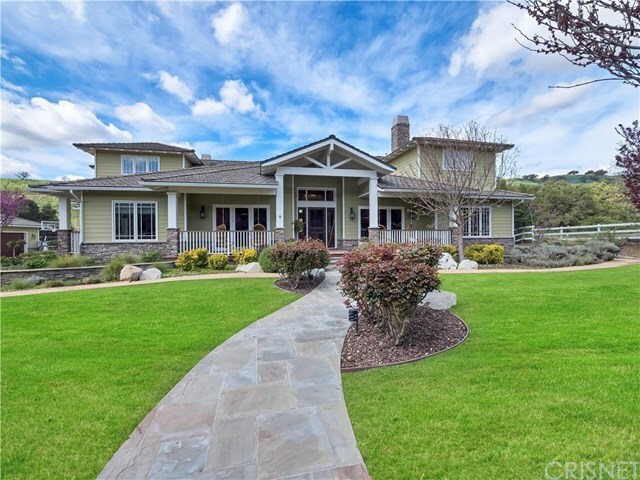 Located at the end of a private road and surrounded by beautiful hills, trails and streams, this exquisite property offers the peace and tranquility that Old Agoura is known for. This exquisite custom home sits on 1.5 acres of gorgeous grounds, with room for horses.Â A true entertainers dream spanning 5998 square feet featuring abundant outdoor spaces and fabulous indoor flow.Â This spacious home features 6 bedrooms, 5.5 baths, incredible farmhouse kitchen and fabulous great room with soaring ceilings, floor-to-ceiling stone fireplace, and rich wood beams. Warm use of wood enhances the formal dining and living rooms. The stunning master suite features fireplace, and balcony with views of the surrounding hills, along with a spa-style master bath that will take your breath away. A separate staircase leads up to a second master/guest suite with stunning views and fireplace. This home was absolutely made for large-scale entertaining! Step outside and enjoy wonderful outdoor living featuring a beautiful pool and spa, large covered patio with fireplace and barbecue area, putting, fire pit with built in seating, and the most incredible views. The outdoor features extensive use of stone, incredible landscape. There are two, three car garages, one is freestanding and could be converted to a guest house or studio.Â Old Agoura is a very special community, surrounded by a national park and offering hundreds of miles of scenic trails...truly a lifestyle worth discovering.